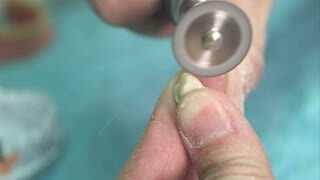 Dentist is mixing composite and amalgam, denturism is defined as the practice by denturists of making artificial dentures and fitting them to patients. 1950s: UNITED STATES: men work in clinical room. Man looks down scope. Man operates machine in box. 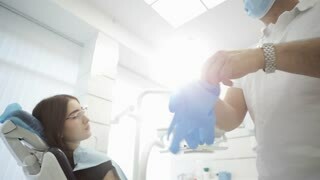 Close-up of dentist puts on gloves at modern dental clinic. 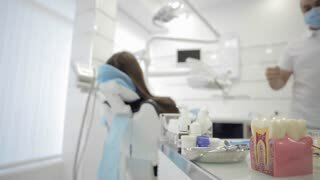 The dentist puts a cotton ball near the patient's tooth. Dentist is applying hot wax into a mold. 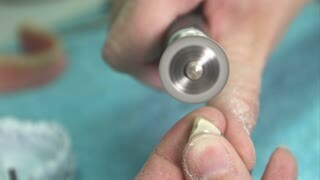 Dental technologist, the restorations may be formed directly in the mouth or may be cast using the lost-wax technique, such as for some inlays and onlays. 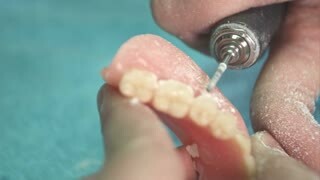 Dentist is applying dentures in elderly, when a tooth is lost, dentures, bridges, or implants may be used as replacements. 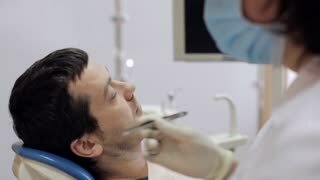 Dentist choosing teeth for an elderly, when a tooth are lost, and "extracoronal restoration" may be fabricated, such as an artificial crown or a veneer. 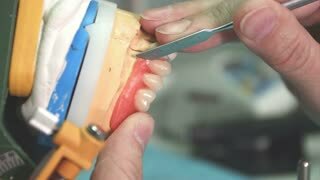 Dentist choosing various types of denture molds, when a tooth are lost, and "extracoronal restoration" may be fabricated, such as an artificial crown or a veneer, to restore the involved tooth.